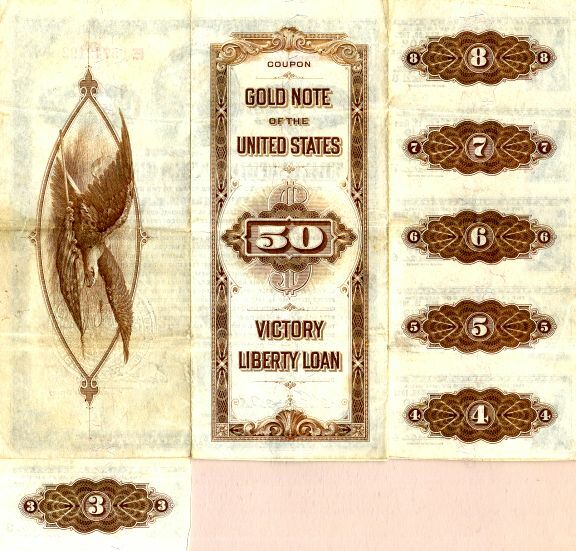 Beautiful Scarce $50 4 3/4% Convertible Gold Note of 1922-23 Liberty Loan Bond from the United States of America (USA) dated 1919. 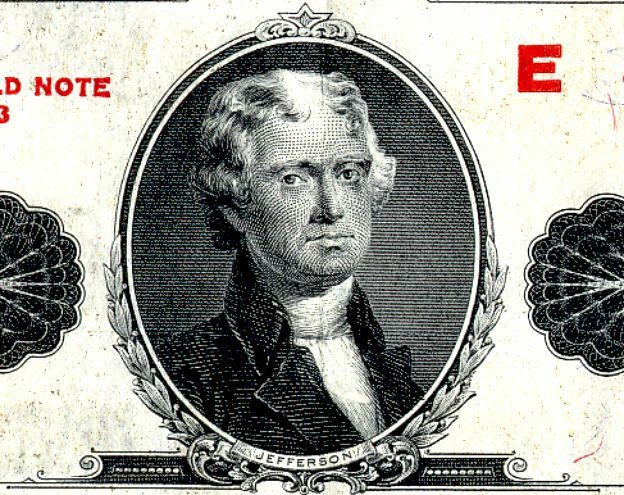 This historic document has an ornate border around it with a vignette of Thomas Jefferson. This item has the printed signatures of the Secretary of the Treasury, Carter Glass, and Register of the Treasury, Houston B. Teehee, and is over 92 years old. Brown eagle on reverse. Folds from storage. 6 of the 8 Coupons attached underneath and to the side. A Liberty Bond was a war bond that was sold in the United States to support the allied cause in World War I. Subscribing to the bonds became a symbol of patriotic duty in the United States and introduced the idea of financial securities to many citizens for the first time. The act of congress which authorized the Liberty Bonds is still used today as the authority under which all U.S. Treasury bonds are issued. Securities, also known as Liberty Bonds, were issued in the aftermath of the September 11, 2001 terrorist attacks to finance the rebuilding of the areas affected. Sep 28, 1918 Fourth Liberty Loan offers $6 billion in bonds at 4.25 percent. Interest on up to $30,000 in the bonds was tax exempt. The 1st Liberty Loan Act established a $5 billion aggregate limit on the amount of government bonds issued at 30 years at 3.2% interest, redeemable after 15 years. It raised $2 Billion with 4 million people purchasing bonds. The 2nd Liberty Loan Act established an $8 billion aggregate limit on the amount of government bonds issued, allowing $3 billion more offered at 25 years at 4% interest, redeemable after 10 years. The amount of the loan totaled $3.8 Billion with 9.4 million people purchasing bonds. The first Liberty Bond issue was undersubscribed�an embarrassment for the Treasury. Therefore, an aggressive campaign was created by Secretary of the Treasury William Gibbs McAdoo to popularize the bonds. The government used famous artists to make posters, and used movie stars to host bond rallies. Al Jolson, Elsie Janis, Mary Pickford, Douglas Fairbanks and Charlie Chaplin were among the celebrities that made public appearances promoting the idea that purchasing a liberty bond was "the patriotic thing to do" during the era. Chaplin also made a short film, The Bond, at his own expense for the drive. Even the Boy Scouts and Girl Scouts sold the bonds, using the slogan "Every Scout to Save a Soldier". Vast amounts of promotional materials were manufactured. For example, for the third Liberty Loan 9 million posters, 5 million window stickers and 10 million buttons were produced and distributed. The campaign spurred community efforts across the country to sell the bonds and was a great success resulting in oversubscriptions to the second, third and fourth bond issues. According to the Massachusetts Historical Society, Because the first World War cost the federal government more than 30 billion dollars (by way of comparison, total federal expenditures in 1913 were only $970 million), these programs became vital as a way to raise funds. Through the selling of "Liberty bonds," the government raised around 17 billion dollars for the war effort. Considering that there were approximately 100 million Americans during that time, each American, on average, raised 170 dollars on Liberty bonds. The principal and interest hereof are payable in United States gold coin of the present standard of value. The legal basis for the refusal of the U.S. Treasury to redeem in gold was House Joint Resolution 192, dated June 5, 1933. This resolution was later held to be unconstitutional by the U.S. Supreme Court. Since the United States had devalued the dollar from $20.67 per troy ounce of gold (the 1918 standard of value) to $35 per troy ounce in the preceding year the 21 million bond holders lost $2.866 billion dollars, approximately 41% of the bond's principal.